The examination was officially conducted on July 24, 2016. A large number of eligible candidates applied for the written exam. Now, they are eagerly waiting for the keys to evaluating their results respectively. The answer keys provide the applied candidates to estimate their respective scores in the examination and conclude their knowledge regarding that. The JSSC JE Main Examination (Civil and Mechanical) comprise of two particular papers. Paper 1 was made by some subjects which include General Intelligence, Reasoning, General Science and Computer Knowledge. The exam paper was conducted for 300 marks in total. Paper 2 include those questions which relate to General Hindi concepts. Again, the 2 paper was also conducted for 300 marks. Both the papers were made by a particular time duration which was 2 hours for particular papers. The commission was formulated by Jharkhand Staff Selection Commission Act, 2008. The organization holds the responsibility for the selection of eligible and qualified aspirants for their recruitment in government jobs in the Jharkhand state itself. The candidates are offered the opportunity to choose the jobs which they desire to work for. The recruitment process is conducted for filling up the vacant posts in the government sector for the eligible and interested candidates. The examination is organized by the commission every respective year. The commission conducts interviews for selecting the eligible candidates. Recently, according to latest updates and news, a conclusion is withdrawn which tells that the Commission has released Jharkhand SSC Junior Engineer 2016 recruitment for filling up 1110 vacant posts of Junior Engineers of both Civil and Mechanical department. Then after that, the organization achieved success for the conduct of preliminary exams on 1st February 2016. After the prelims examination, the commission held the mains exam on 24th July 2016 for various eligible candidates. According to the updates, we came to know that now the Commission has released the answer key for Jharkhand SSC Junior Engineer Mains exam. • Open the official website, ‘www.jssc.in’. 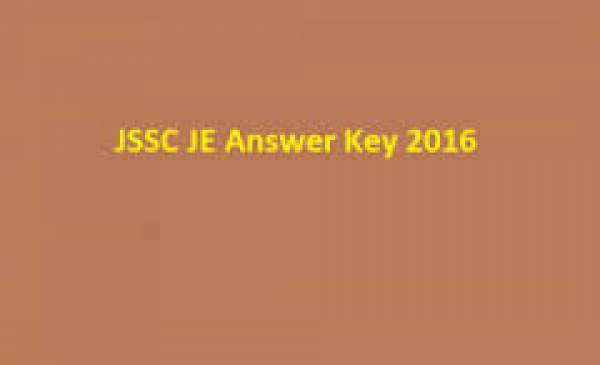 • Click on the link which shows JE mains Exam 2016 Answer Keys. • Now, fill up the respective information. • The screen would show the answer keys.